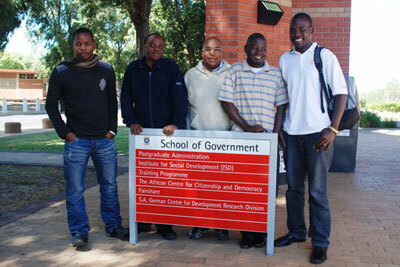 The Centre congratulates Dr. Charlton Tsodzo, who successfully defended his PhD thesis on Tuesday, 20th December 2011. He is the first graduate of the International Development Studies Doctoral Programme of the Centre! He wrote his thesis on "The Role of Information & Communication Technologies (ICTs) in Improving Health Outcomes in Developing Countries: The Case of the SimPill Technology & Tuberculosis Treatment in South Africa". The PhD thesis was supervised by Prof. Dr. Werner Voss. The second supervisor was Prof. Dr. Wilhelm Löwenstein. 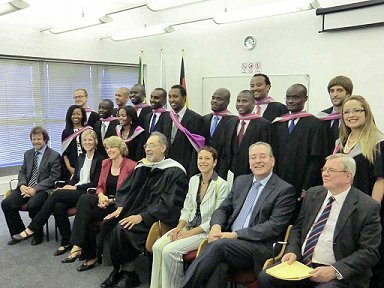 On 9 December 2011, 14 new Masters graduated from the Bochum Programme of Development Management at the Development Research Division of the South African - German Centre for Development Research and Criminal Justice. Congratulations to all of you! The DAA D Lecturer Iris Vernekohl from the Development Research Division of the Centre is offering an “Academic Writing and Publication Workshop”. The publication workshop series is open to Master and PhD students from both division of the Centre, is limited to 20 participants, and takes place Tuesdays, 10.00-13.00, from 6 September to 25October. Kabaso Kab we - one of our Master students - was awarded a DAAD scholarship to take part in the Summer School "Democratic Governance and Civic Engagement" at the University of Osnabrück/Germany, which takes place from July 4 - July 23 2011. Eria Serwajja - one of our phd students - was invited to participate in the "Brown International Advanced Research Institutes 2011" at Brown University/US, which takes place from June 4 - June 18 2011. The Development Research Division (DRD) of the DAAD-funded South African-German Centre for Development Research and Criminal Justice at the University of the Western Cape (UWC) in South Africa is a cooperation project of the Institute of Development Research and Development Policy of Ruhr-University Bochum, Germany, and the School of Government and the Institute for Social Development of the UWC. The Criminal Justice Division of the double centre is run in cooperation with the Law Faculty of the Humboldt-University Berlin and the Law Faculty of the University of the Western Cape. The South African-German Centre for Development Research and Criminal Justice is the only centre in South Africa chosen for support by the German Academic Exchange Service (DAAD) as part of their current "African Excellence" initiative. In addition to the centre at the UWC, this initiative established four other African-German centres of excellence which are based in Ghana, in the Democratic Republic of the Congo as well as in Tanzania and Namibia. The establishment of such centres of excellence is a cornerstone in the DAAD programme for Africa for which funding is being provided by the German Federal Foreign Office. 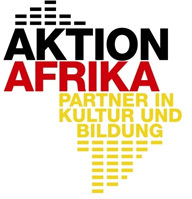 The goal of the African Excellence programme is to contribute significantly to the raising of the quality and relevance of education in selected fields at the chosen African universities, in particular by expanding the teaching and research capacity of such institutions and by promoting effective forms of networking between themselves, their German partners and other research institutions. The new centres will aim to provide postgraduate students with state-of-the-art education and training of the highest international standards, whilst at the same time promoting high quality, collaborative research and innovative forms of international cooperation. In its postgraduate teaching and research activities, the DRD will build upon the long-established cooperation between the UWC and the Ruhr University of Bochum. We hope that you'll find all the information you're looking for. For further questions please don't hesitate to conctact us. Academic Co-operation with the UNIMA in action! As one of the first measures of the new Agreement on Academic Co-operation with the University of Malawi, Steven Dunga - a Phd student, and Davies Luhanga, Ekari Chauluka, Atamandike Chingwanda and Harry Kamdima - 4 Master students of the Economics Department of the Chancellor Colleague are taking part in the "Project Cycle Management Module" and two other Moudles, offered at the Development Research Division of the Centre at the University of the Western Cape. Whereas Steven Dunga is staying for a period of 6 weeks, the 4 Master students received scholarships for a period of 3 months. Agreement on Academic Co-operation with the UNIMA was signed! One of the goals of the Development Research Division of the South African-German Centre for Development Research and Criminal Justice is to establish new co-operations with universities in Sub-Sahara Africa outside South Africa itself for strengthening the regional impact of the centre activities. 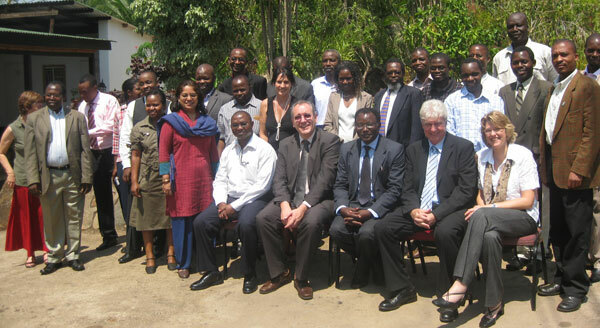 For this purpose a co-operation workshop took place in October 2009 in Zomba / Malawi together with colleagues of the Chancellor College of the University of Malawi where a number of fields for future co-operation activities have been identified. Now we are glad to announce, that the trilateral "Agreement on Academic Co-operation between the Ruhr- Universität Bochum, the University of the Western Cape and the University of Malawi was signe by all of the above mentioned parties. Based on this agreement the University of Malawi will become part of the centre activities. As one of the fist measures based on the new agreement, students of the Economics Department of the Chancellor Colleague will have the opportunity to take part in selected Master modules offered at the centre. We consider this agreement as the first step of establishing a network of co-operating universities in the Sub-Saharan Region. New Scholarship Holders at our Centre! 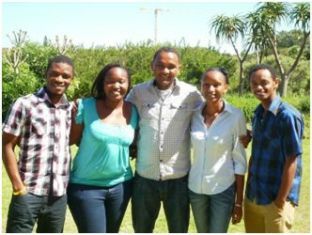 We want to welcome six new scholarship holders at the Development Research Section of our Centre at the University of the Western Cape. Whereas Kennedy Alatinga (missing on the foto) and Kassahun Kelifa (middle) are taking part in our phd programme, Collins Yeboah, Winnie Sambu, Joyce Marangu and Seyfe Tadesse are studying the MA in Development Studies.